Phuket is a tourist town that is famous for the beautiful sea and beach scenery, that has been compared with the beaches of France. Regarding travelling around the island, there are many options available including renting a car to drive yourself around, hiring a taxi, or using one of the many Tuk Tuks or taxis that can be found waiting outside the hotels and residences. These are popular because they are very convenient, and can take you to a wide variety of interesting locations around the island. 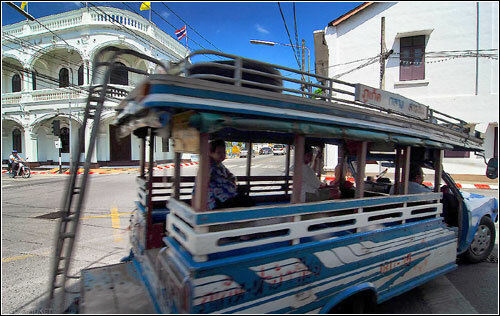 Another popular and cheap form of transport found in Phuket is the Song Thaeo. These wood trimmed, light blue vehicles are named after the two (sawng) rows (thaeo) of seats that can accommodate many passengers. Some of these also have a third row of seats, and offer an even lower price. Song Thaeos run regularly along the public roads of Phuket, especially between Phuket Town and the main beaches including Kata, Karon, Rawai, Phatong and Nai Yang and can deliver you to many interesting locations on the way. Riding in Song Thaeos also offer the advantage of being able to appreciate the passing scenery around the island, the fresh air and you also have the opportunity to meet a wide variety of local people. When there are lots of people, it is not uncommon to see young men standing on the back step hanging on, and even sitting on the roof when there is no room below! Regarding the price, this is one of the most affordable forms of transport on the island, with trips costing between 30-60 baht and offers and interesting alternative to what you may be used to. So when you’re visiting Phuket, you mustn’t forget to try this charming and convenient form of transport.